Many factors are taken into consideration including the stage of cancer, health of the patient, and personal preference before recommendations are made regarding the timing of breast reconstruction. It’s important that your entire team of doctors — breast surgeon, plastic surgeon, radiation oncologist, medical oncologist, and other caregivers — meet as a group and discuss your unique situation. Ideally, this group should meet before you make your decision about mastectomy or lumpectomy because the type of breast surgery you have can affect the reconstruction outcome. 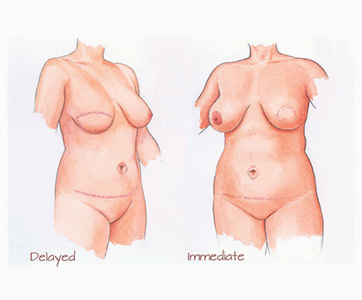 Because each breast cancer is unique, each reconstruction surgery and its timing are unique. Together, you and your team can decide on an approach that is best for you. Getting a breast cancer diagnosis is extremely stressful and very scary. Making decisions about mastectomy or lumpectomy and other treatments is extremely emotional, and making even more decisions about the type of reconstruction to have and the timing only compounds the level of anxiety. Remember to pause and give yourself time to think things through and weigh all of the options. Be sure to do your research and seek multiple opinions before deciding on your team, and take time to think of things long-term. Your reconstructive results will matter greatly in the future, even though the stress of cancer may not make it seem so right now. Am I a candidate for immediate reconstruction? If not, why? What are the risks associated with immediate vs. delayed reconstruction? How will my results differ with immediate vs. delayed reconstruction? What will my recovery be like and what are my limitations? If I need delayed reconstruction, how long will I have to wait?